According to the most recent adherents.com data, approximately 77% of the world’s population is non-Christian. 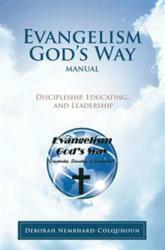 Hoping to spread the word of Christianity and inform readers of the importance of evangelism, Deborah Nembhard-Colquhoun delivers her new book “Evangelism God's Way Manual: Discipleship, Educating, and Leadership” (published by WestBow Press). Deborah Nembhard-Colquhoun is an ordained evangelist with the Evangelical Association of Canada, and a college graduate with a degree in theology. She has worked extensively with churches across Canada. She is the founder of Evangelism God’s Way Ministry in Toronto, Ontario, which teaches and equips leaders to be effective evangelism ministers. Nembhard-Colquhoun and her husband, Wilkie, live in Ajax, Ontario, with three children: Kevin, Andre and Joshua.